It is thought that the site of today’s ship canal is the very site where Duluth’s namesake, Daniel Greysolon Sieur du Luht, first landed when he reached the end of Lake Superior in 1879. If true, du Luht and his party likely pulled their canoes to shore at this point because it provided quick access to the St. Louis River on the western side of Minnesota Point: the landing site was a trailhead for a path the local Ojibwe called Onigamiinsing or “Little Portage.” Why they didn’t simply canoe through what would become known as Superior Entry, the natural opening between Minnesota Point and Wisconsin Point, is open to speculation. They likely had reached the head of the lakes via the north shore, and the entry was a seven-mile paddle south. When the pioneers of Duluth Township established their community in 1856, they incorporated the portage into a platt of the city’s future streets. Appropriately enough, they named the roadway “Portage Street.” A year later the Minnesota Legislature incorporated the Duluth Ship Canal Company with Duluth pioneers George Nettleton, James Ray, and Edmund Ely as directors. The state authorized them to cut a canal three hundred feet wide through Minnesota Point, but the Panic of 1857, a nationwide depression, put an end to the idea. In the late 1860s, as Duluth boomed with Jay Cooke’s money and the promise of his coming Lake Superior & Mississippi Railroad, Duluth constructed a harbor on the lakeside of the point. Even though the city attempted to construct a breakwater to protect vessels at dock, Lake Superior storms quickly made it clear that the safest harbor was on the west side of the point. So, one of the first acts of the City of Duluth, when it was first established in March of 1870, was to dust off an old idea: dig a ship canal through Minnesota Point to allow vessels to pass through to safe harbor. They chose Portage Street as the path of that canal. Digging that canal would become the biggest myth surrounding the city’s history, a tall tale many believe to this day. In the September of 1870, the city accepted a $50,000 loan from Cooke’s Railroad and used it to hire the Ishpeming, a steam-powered dredging tug owned by the W. W. Williams & Co. On September 5, the Ishpeming, with Major John Upham at the controls, took its first bite out of Minnesota Point. When winter froze the gravel digging stopped for the season. Over the winter, Superior, Wisconsin, worked to stop the digging. 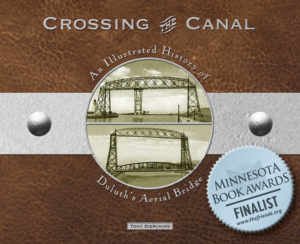 The city’s leaders recognized that the canal would divert shipping traffic from the natural Superior Entry, a blow to Superior’s economy, but they couldn’t argue to have the digging stopped simply because it would help Duluth better compete with Superior. Instead, they had to argue that the canal would actually physically hamper shipping traffic to Superior. So in order to receive an injunction to stop the efforts in Duluth, Superior argued that the canal would divert the waters of the St. Louis River through the canal, allowing silt to clog the Superior Entry, hampering traffic to Superior. That’s when the facts of the story get mixed up into tall tales. In many versions of the myth, the courts sided with Superior the week before the Ishpeming returned to digging in April 1871. 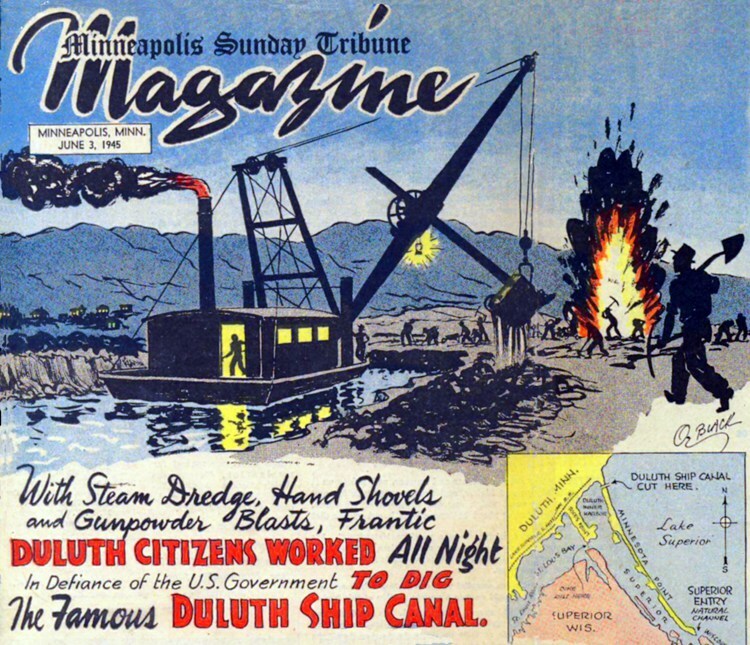 An injunction ordered Duluth to “absolutely desist and abstain from digging, excavating and constructing…said canal.” It was dispatched to Duluth via a courier: a soldier from Kansas (or St. Paul, or Chicago…), some said; others claimed the messenger was none other than Superior (and Duluth) pioneer George Stuntz, the first man of European descent to live on Minnesota Point. In 1922, memoirist Jerome Cooley claimed a telegram sent on Friday, April 28, told Duluthians the injunction would arrive by Monday. So the Ishpeming’s crew went to work at dawn Saturday and “didn’t stop until Monday noon.” The canal was open before the injunction arrived. Author Dora May McDonald, writing in 1949, tells that same portion of the story with more flair. In her account, after the Ishpeming struck frozen gravel that Saturday morning, word came that Stuntz had left St. Paul bound for Duluth with injunction in hand, destined to arrive Monday. Duluth city fathers called for every able-bodied man, woman, and child in Duluth “who could handle a spade or shovel, or beg, borrow, or steal a bucket or a bushel basket.” Citizens rushed to the work site and “dug, scratched, and burrowed till it was finished.” On Sunday rowboats filled with angry Superiorites arrived to watch and heckle the Duluthians’ efforts. At the break of dawn on Monday morning, the Duluthians had cleared a canal. When Stuntz arrived, the tug Frank C. Fero was making her very first pass through the canal; the canal was a navigable waterway, rendering the injunction moot. He tore up the document and that was the end of that. Except none of it was true.